Army of the Tennessee – (1862-1865) – A Union army in the Western Theater of the Civil War, it was named for the Tennessee River. 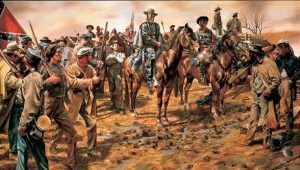 When it was first organized in October, 1862, it contained but one corps, the XIII, which held 11 divisions and a cavalry command. It was soon reorganized into four corps, with each having two or three divisions and detachments of artillery and cavalry. Its first commander was General Ulysses S. Grant, who was severely tested in April, 1862, when he and his troops obtained victory in the bloody Battle of Shiloh. Later that month, he sent the Union armies to prosecute the relatively bloodless Siege of Corinth and then strained to hold Union positions in Tennessee and Mississippi. Six months later, in October, 1862, Grant’s command was reconfigured and elevated to departmental status, as the Department of the Tennessee. He commanded these forces until after his critically important victory at Vicksburg, Mississippi in July, 1863. The Army of the Tennessee was then commanded by General William Tecumseh Sherman, while the army marched and fought in the Chattanooga Campaign, through the Relief of Knoxville, and the Meridian Campaign. In March, 1864, Sherman was placed in command of the western armies for the Atlanta campaign. Now under the leadership of General James B. McPherson, the army fought their way south from Chattanooga, Tennessee, to Atlanta, Georgia.McPherson was killed during the battles around Atlanta, and leadership was transferred to General Oliver O. Howard, who remained in command of the army for the rest of the war. Throughout its existence, the Army of the Tennessee was constantly fighting or campaigning and earned a reputation that was second only to that of the much larger Army of the Potomac. The rugged western-state soldiers who served in the Army of the Tennessee ended their service with the surrender of General Joseph E. Johnston’s Rebel forces in April, 1865. The next month they paraded through the streets of Washington in the grand review, and then were mustered out of service, disbanding the Army of the Tennessee for all time. During their existence, they never lost any of their major campaigns and obtained one of the best combat records of any in the Union army.